New Physis, – an expression for awakening of man and redemption of Nature. Today we rarely think of the origins or roots of our cultural heritage and those forces which have shaped our thinking and world outlook. It is erroneously assumed that people have always thought the way we do in the 20th/21st century. History being just a story played out in a Hollywood film set. We rarely consider the changes humanity has made in its states of consciousness throughout the period of recorded history, and we cannot here even consider what happened before history! Little do we realise that our concept of times past is dependent upon the translators and commentators of the evidence admitted into history. This physical evidence of archaeology and written works are interpreted, and history, being a contemporary study, is continually reinterpreting the ideas, events and people of those cultural epochs, as more information comes to light, or when someone posits or proves that the previous interpreters really got it all the wrong way around. The ancient Greek physician Hippocrates (c470-400BC) is called the father of modern medicine, and this declaration arises from little understanding. An aspect which has entered into modern medicine is the Hippocratic oath, taken by the graduating ‘doctors’ before commencing ‘practice’. The interpretation of the Hippocratic writings has been altered much in translation and retranslation. Those sensitive in the use of language(s) and the problems of English as a language for expressing subtle and complex nuances of thinking and feeling, will realise that English is not easy or specific, and even more so when the original Greek needs to be translated. The ancient Greek had a totally different worldview. Their view of the cosmos was far richer from the macrocosmic viewpoint, dimly still able to perceive the ‘gods’ being active in the world. They could not envisage the world as modern man views it through the material worldview, though the Greeks were the formers of the thinking processes. The Greeks called Nature – Physis. This is one interpretation of the word. Another translation is ‘the real constitution of things’. WHS Jones suggests that physis is ‘the truth about the universe.’ Hippocrates referred to Physis as that which heals. The source of our understanding and practice of healing is in the Physis – in Nature. But what is Nature, which later Paracelsus (1493-1541) referred to as Great Nature? Underlying this is an intimate understanding of what we are as human beings; the position and evolution we have in Nature. We are a part of Nature, not outside of it. Our dilemma is, as Heraclitus states, that Nature prefers to hide. The hidden Physis represents the inexpressible in life. Nature cannot be measured but can be perceived by one who desires perception. A hidden connection is stronger that an apparent one, which is obvious when a connection is perceived. Natural medicine in our modern idea of it would entail using only natural remedies or therapies and not the products of material science. The reality is far greater than this, though, as the physis is difficult to grasp, but we must seek to do so. Perhaps the greatest challenge that lies before human beings as a collective, is to acknowledge the connection to Nature and that we are not apart from Her, as our material scientific thinking has led us to view the world. 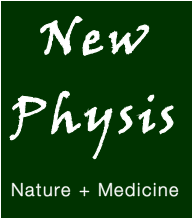 New Physis, then, seeks to provoke commentary on Nature + Medicine, to balance material scientific thinking in medicine, ecology, agriculture and social living, to enrich our understanding and awareness of Nature. Her healing power – Vis Medicatrix Naturae – is our pathway to healing – becoming whole. Man is a microcosm in the macrocosm of the universe, depending on all the laws working therein. We must realise that there is nothing in heaven or on earth that does not also exist in man himself. This understanding is at the centre or the essence of all teachings that arise from Hermeticism, which is in reality behind all our understanding and all that is taught. Those great men and women of science and thinking throughout the ages whose contribution has shaped our material world attained their understanding through mystical insight. Not one contrivance or invention, mathematical formulae, or chemical process, would have come into being if illumination were not the essential hidden part. Nature and Man have a reciprocal influence upon one another, which reaches into the smallest particles through water, earth, sun, season, movement of stars, food, soil, etc. The system that governs the human being itself is ‘Great Nature’. Both Man and Nature are interdependent from an evolutionary point of view. Inner vision, in the light of modern knowledge, is needed to balance the unseen effects of human activity on matter (Nature) within the physical world. We need to assume the mantle of responsibility within the spheres in which we have influence and a measure of control. In the field of medicine this is sorely needed. The French writer Edouard Schuré (1841- 1929) was of the firm conviction: ‘Today neither the church, imprisoned in its dogma, nor science, locked up inside matter, any longer knows how to make men whole. Science need not change its method, but it must broaden its scope’. It is the desire for New Physis, in whatever small way, to be a forum to guide us to appreciate this role and responsibility we have in living today: to unfold our understanding in the field of natural medicine and to deepen our understanding of Great Nature. No one field of human endeavour or research is greater than another, providing the intent is with the Spirit of Humanity. No one authority or influence is greater than another, when it comes to the expression of the infinite. This gives us scope to meet all thoughts and ideas, and evaluate them from the position of unfolding perception.